20 May 2013, Singapore – With four more months to the highly anticipated 2013 FORMULA 1 SINGAPORE GRAND PRIX, race promoter Singapore GP has unveiled a slew of exciting activities as part of the 'Rev Up Singapore!' campaign to share the excitement of Formula OneTM across the island. New initiatives planned to rev up Singapore this year include organising a Thursday Pit Lane Walk for non-ticketholders, a motorsports carnival in collaboration with the Institute of Technical Education, free preview screenings of the movie RUSH, a corporate 'give-back' ticket scheme as well as exclusive behind-the-scene tours for students. 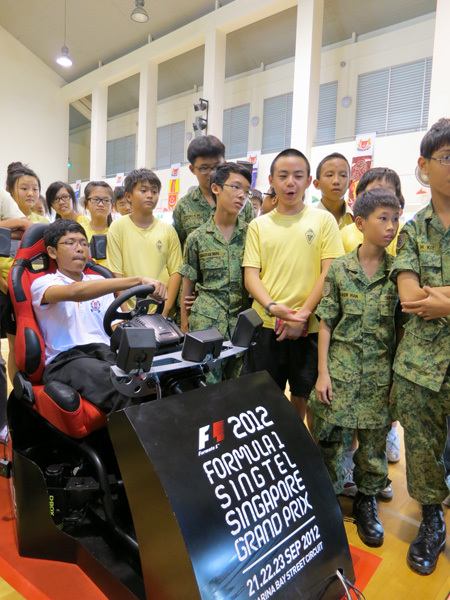 In addition, Singapore GP will be expanding the well-received Singapore GP School Visit programme introduced last year. Mr Colin Syn, Deputy Chairman of Singapore GP Pte Ltd said, "Singapore GP is expanding on our efforts in previous years to share our excitement and passion for Formula One™ to even more Singaporeans this year with the 'Rev Up Singapore!' campaign. We invite people of all ages to participate in our activities as we gear up for another exciting instalment of the FORMULA 1 SINGAPORE GRAND PRIX." Mr Lionel Yeo, Chief Executive of the Singapore Tourism Board added, "STB is fully behind Singapore GP's efforts to introduce more activities to strengthen community engagement around the Singapore race. Since its debut five years ago, Singaporeans and our local communities have been integral to the successful hosting of the Formula One™ race. Their line-up of activities will help to widen local participation and engender greater interest and pride in our race, the crown jewel in the entire Formula One calendar." For the first time ever, 2,500 members of the public will be able to experience a Pit Lane walk for a privileged view of the Formula One™ garages up-close, as well as the F1 Village in Zone 1 of the Marina Bay Street Circuit, before the Circuit Park opens to ticketholders. The Thursday Pit Lane Experience will take place on 19 September, a day ahead of the Circuit Park's opening. Usually accessible only to Formula One Paddock Club™ ticketholders over the race weekend, the Pit Lane Walk offers participants an exclusive first-hand view of the team garages at the Pit Building. These 2,500 participants will also get to enjoy the F1 Village's carnival atmosphere, explore the interactive game stations, be entertained by live stage performances and roving acts as well as check out the memorabilia at the merchandise booths. Singapore GP has teamed up with Cathay-Keris Films to present free preview screenings of RUSH to 1,500 lucky Singaporeans. The screening will take place at the Cathay Cineplexes in Ang Mo Kio, Causeway Point, Cineleisure Orchard, Downtown East and The Cathay on 18 September 2013, before the movie officially opens in Singapore. Directed by two-time Academy Award winner Ron Howard (The Da Vinci Code, A Beautiful Mind), RUSH is based on a true story about the epic rivalry between legendary Formula One™ drivers James Hunt and Niki Lauda during the 1976 Formula One™ season. 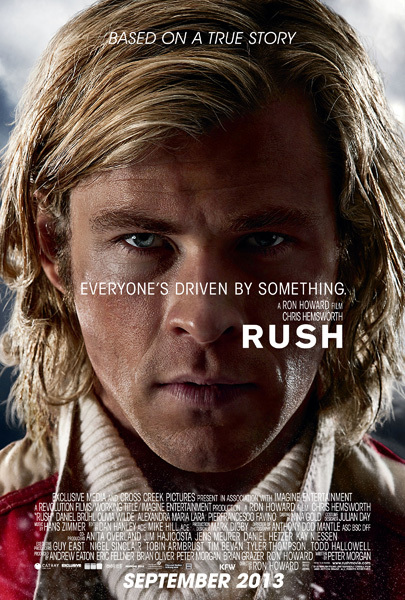 The spectacular re-creation of the rivalry between the two world champions stars Chris Hemsworth (The Avengers, Thor) as the charismatic James Hunt, Daniel Brühl (Inglourious Basterds) as perfectionist Niki Lauda, and Olivia Wilde (TRON: Legacy) as English model Suzy Miller, Hunt's first wife. As a prelude to the 2013 FORMULA 1 SINGAPORE GRAND PRIX festivities, Singapore GP will be organising a motorsports carnival open to members of the public. This will be held in conjunction with the ITE Fiesta on 25 and 26 August at ITE College Central. Visitors will be able to try their hand at interactive Formula One™-themed game stations, test their racing skills with the Singapore GP simulators, and embark on a visual journey through a photo exhibition that relives five years of night racing. Singapore GP is also reaffirming ties with the Institute of Technical Education (ITE) with an extension of a Memorandum of Understanding (MOU) between the two parties. Under the MOU, more than 4,000 ITE students have been offered this unique training and work experience programme at the Marina Bay Street Circuit since 2009. The renewed five-year collaboration will see 1,000 ITE students undergo training and real-life work experience at the FORMULA 1 SINGAPORE GRAND PRIX annually. Students from polytechnics and universities in Singapore will also be able to attend a series of educational talks by members of the Formula One™ fraternity, including a talk by Lotus F1 team and Pirelli. More speakers in the series will be announced shortly. Students can submit their topics of interest on the Singapore GP Official Facebook Page or by tweeting it to @F1nightrace with the hashtag #f1sgp101. Singapore GP is encouraging corporate clients to contribute a portion of their tickets to deserving local causes, with the introduction of the 'Singapore GP Give-Back' scheme. This will give Singaporeans who would not normally be able to attend the race a chance to experience the thrills of the Marina Bay Street Circuit. For more information on the scheme, interested parties can contact the Singapore GP sales team at hospitality@singaporegp.sg. Having received positive feedback from the participants of the pilot programme last year, Singapore GP is working with the People's Association to expand the School Visit programme to 15 secondary schools this year. Students will gain an insight into the world of Formula One™ through educational talks, interactive game stations and a photography exhibition. Some of the secondary schools Singapore GP will be visiting include Crescent Girls', Outram and Ping Yi. Selected students from the different schools will also get a once-in-a-lifetime opportunity to participate in an exclusive behind-the-scenes tour of the Marina Bay Street Circuit in September. This tour will offer participants a first-hand look into the Paddock, team garages and hospitality homes, and even restricted areas like the Race Control room, podium and commentary booths. 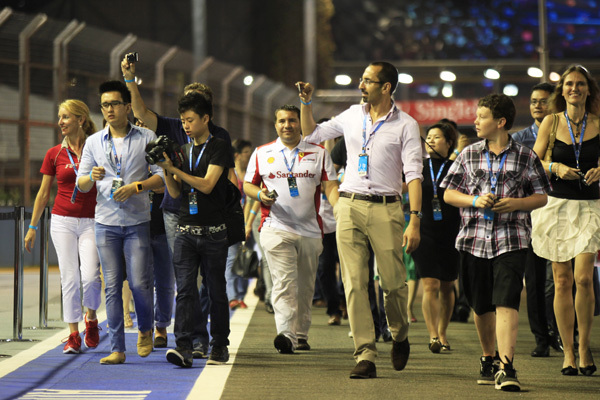 In addition, participants will visit the F1 Village and be one of the first to enjoy a sneak peek of what race fans can experience at the 2013 FORMULA 1 SINGAPORE GRAND PRIX. *For registration details, please refer to Annex A.